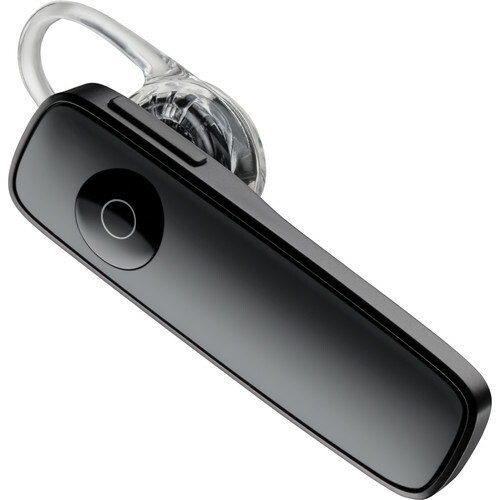 Enjoy hands-free calling and hands-free answering with the Marque 2 M165 Mono Bluetooth Headset from Plantronics. This headset features the ability for you to use your voice to either say "Answer" or "Ignore" to deal with incoming calls. Manual control over incoming calls is also possible with the built-in call button. Plantronics has engineered the Marque 2 with dual microphones, which are designed to help make sure your conversations remain clear. They are designed to filter out noise from the wind and your surrounding environment. Clearer audio quality doesn't just benefit phone calls. You can also use this Bluetooth headset to operate your phone's Siri, Google Now, or Cortana personal assistant software. To help make using the Marque 2 a more comfortable experience, Plantronics has included three different sizes of silicone gel eartips. These eartips are thin, pliable, and meant to gently tuck into the contours of your ear to ensure a stable fit. Also included is a clip-on earloop for added stability. Plantronics has designed the DeepSleep mode to drastically increase your Marque 2's standby time. This power-saving mode is activated once your Marque 2 is away from your phone for over 90 minutes. When you know you're back in range, just tap the call button to wake up the headset. Using Bluetooth technology, the Marque 2 has a range of up to 33', and with DeepSleep you can extend your standby battery life by up to 180 days. U.S. users will get voice-guided pairing instructions for iPhone and Android smartphones when the headset is powered on for the first time. The Marque 2 supports Multipoint technology, which lets you pair and answer calls from up to two smartphones. Send a Tone: If your phone is within Bluetooth range (up to 33'), you can play a sound file from your phone to play in the headset. Track it: With GPS location services enabled on your phone, you can review its recent activity on a time-stamped map to help discover where your Marque 2 was last used. In addition to tracking down your headset, the app gives you an on-screen battery meter in the notification bar if your smartphone is running Android OS 3.0 or later. The MyHeadset App for iPhone and Android mobile devices lets you control your Marque 2 and give you important information on how to use it. iPhone Users: The app will show you how to pair, control, and command the Marque 2 headset. It will also let you do a sound check before a call, record memos, discover streaming audio, and even play a few games. Android Users: The app will let you do a sound check, record memos, and discover streaming audio. If you are running Android OS 3.0 or later, the app will also give you an on-screen headset battery meter. Box Dimensions (LxWxH) 8.0 x 4.2 x 2.1"
Marque 2 M165 Mono Bluetooth Headset (Black) is rated 4.0 out of 5 by 179. Rated 5 out of 5 by KHales from Immortal and Indestructible! I have had my Bluetooth for about a year and a half now. This is the longest I have had one that has not broken or been somehow damaged. In the past I always had the larger Bluetooths, and they would break. I was a bit concerned with how small it was (I was determined I was going to lose it). I have literally washed AND dried my Plantronics-Marque 2 M165, 6 or 7 times! Each time I found it in the wash I assumed that this was the last straw and there was NO WAY it was going to work...AND IT DID!!! This Bluetooth is indestructible! I am very pleased with the quality. I never write reviews (really because I don't want to take the time), but I just had to write one for this product. I love it! Rated 5 out of 5 by rita4660 from Great product I bought this couple days ago. 1st time bluetooth user. Love the voice command to answer calls. Love the fact the I can leave my phone in my purse and still answer my calls. Just wish it would tell me who is calling in order to ignor or not. Love the reading of my text messages as well. But wish I could reply back threw the bluetooth. Love the fact that this will also play music and you can also hear all my games I play on my phone as well. Can now play my bingo games without disturbing anyone else and still b able to get all my phone calls as well. Absolute fantastic product. Love my Marque 2. Thank you. Rated 4 out of 5 by DlordNix from works better than I expected I bought the Marque 2 a few months ago to replace my old Bluetooth head set because it accidently got washed. Last weekend my family and I went on vacation to Cleveland, OH. Up till this point I had only used my Marque headset for making calls. While on our vacation I used the GPS function on my phone a lot to get to the different places we wanted to visit. I was very surprised when my phone was reading out the directions in my headset. I was very happy because it adds an extra bit of comfort because I don't have to turn my kids movie off to hear the directions. The only down side is the speaker cracks when I'm on certain phone calls. Rated 5 out of 5 by Ghimmy51 from Takes the work out of bluetooth I've had other bluetooth earphones and had to jump through hoops to get them to pair and connect. They were good brands and cost about the same. I got the wife this one in white and decided to get the black one for myself. I love the voice that instantly tells talk time and how it instantly connects and tells me. Even tells me when I power off! I also like the assortment of silicone ear pieces and the over the ear option included. I only use the ear hook and no silicone because it fits deeper, and feels more secure for me. I work outside and fear losing it and my ear shelters the micro-usb connector. I don't have to "go deaf" in that ear either, which is a big safety factor in construction. I couldn't ask for better. Rated 1 out of 5 by Tenorvoice from Majorly uncomfortable I have been wearing this for 5 days now and it is the most uncomfortable headset I have tried yet. I have tried all three adapters and they all make my ear start hurting within an hour of wearing it. I have tried it with and without the over the ear piece and I will say that it feels better with it. As far as the sound it is so/so but the fact that this does not actually enter the ear canal it makes it harder to hear someone or hear music when it is playing without having to blast it wide open. I really wish I could return this for something else, but I doubt it, because I am done wearing it. Rated 5 out of 5 by Mrshjm3 from Great product, FANTASTIC company service This is, by far, the best headset I have ever owned. I bought a second one, to have at the office, as well as in my car. Best part about this, is that after using both headsets consistently for about a year, the battery stopped charging. I simply went to the website, filed a claim (took less than 5 minutes), sent the headsets back to Platronics, and received new ones in less than a week. No hassle. No phone calls. I am floored with this kind of service. Not something you see in many companies, these days. I am, now, a faithful Platronics consumer. Rated 5 out of 5 by Raelen from Love it BUT...volume control is limited. Lowest setting even too loud! I love everything about this product EXCEPT, it has only 3 volume control levels and even the lowest is too loud. It hurts and I often have to pull the earpiece out a bit and then it is not secure in my ear. Has anyone else ever raised this con? Is there any way to adjust the volume manually to personal preference. I've tried to customize it with the iPhone 5 volume buttons, but it doesn't manually adjust it. It's making me want to return it. Help! whats difference between 88120-01 and 88120-42 ?